Winnebago has several very popular Compact Class C RVs – the Trend, Fuse, View and Navion. 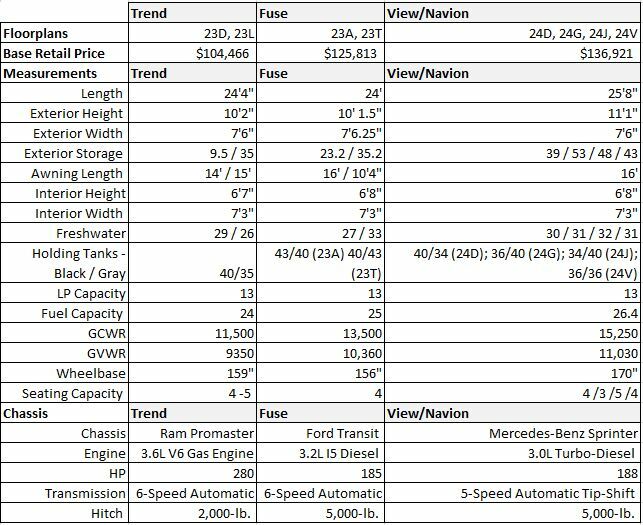 They come in at various price points, lengths, and chassis types. 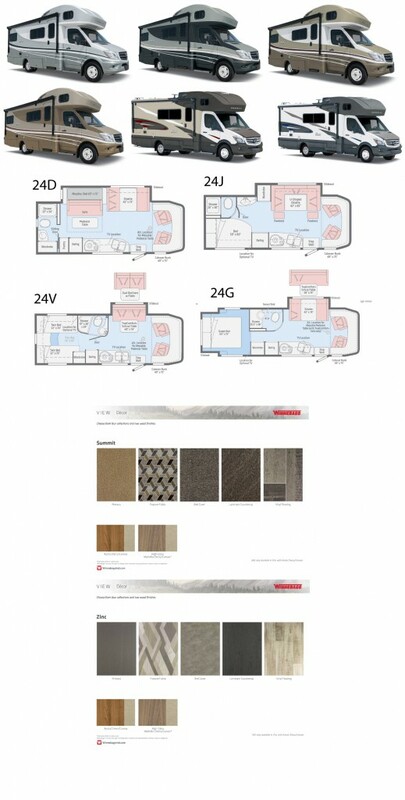 We compared the coaches’ floorplans, price, measurements and chassis so you don’t have to! 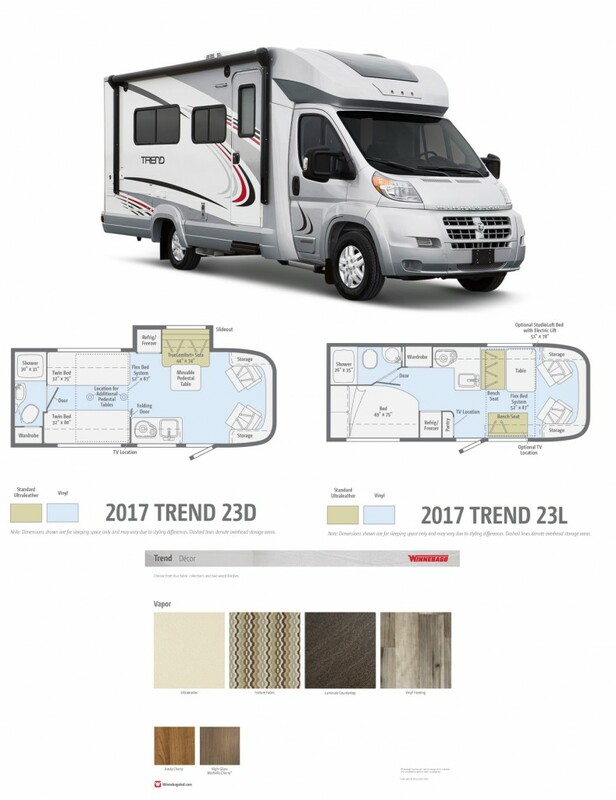 The Winnebago Trend – Roam the country on your own terms in the Trend, Class A living in a compact Class C design. A coach built on the Ram ProMaster chassis that has plenty of power with its lower floor front-wheel drive and strikes a bold pose. Inside you’ll find high-end features such as LED lighting, MCD blackout roller shades and soft Ultraleather furniture, including two Easy Swivel cab seats that spin turn into the main body. Two 23-foot floorplans give you the nimble footprint to go almost anywhere with a surprising amount of sleeping space thanks to the Flex Bed System in the 23D and the available powered StudioLoft bed in the 23L. Don’t wait for adventure to find you; seek it out in the Winnebago Trend. See our Trend inventory here. 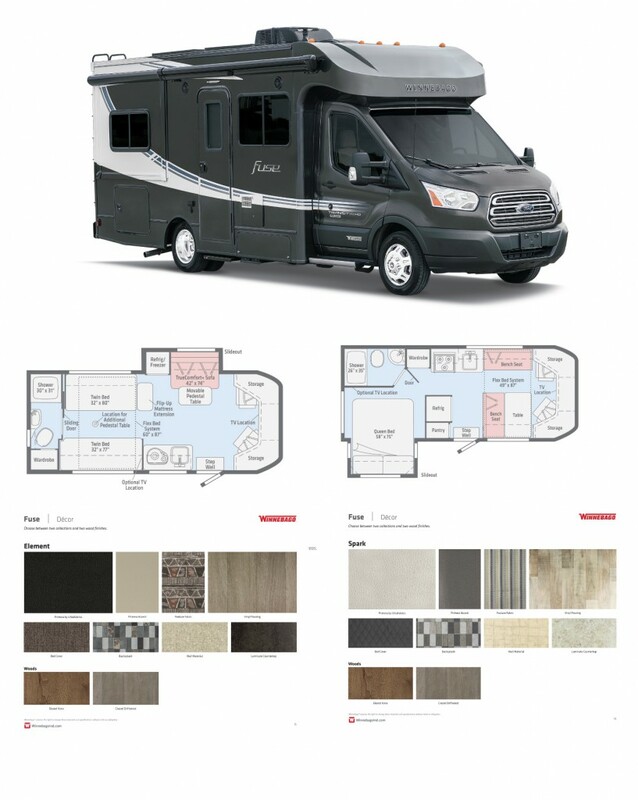 The Winnebago Fuse – Designed around the Ford Power Stroke diesel engine, the Winnebago Fuse comfortably accommodates up to four adults in a nimble, fuel-efficient package. Two surprisingly roomy, slideout-equipped floorplans come complete with a full galley, entertainment system, and a full bath with a shower. In the rear-bath 23A, the Flex Bed System lets you opt for twin beds or a single queen bed, while the 23T features a corner bath and walkaround queen bed. Each Fuse includes a powered armless patio awning with LED lighting, solar charging system, and a compressor-driven refrigerator, while the available bike rack and a host of other options let you configure your Fuse to your needs and taste. See our Winnebago Fuse inventory here. The Winnebago View and Navion – The motorhome that started the Mercedes-Benz Sprinter revolution just keeps getting better. From the powerful and economical turbo-diesel engine to the elegantly appointed interior, the Winnebago View and Navion are the ultimate in efficient, luxurious RV travel for couples and families. The View and Navion’s four slideout-equipped floorplans offer a variety of sleeping and living-space choices. All feature swivel cab seats for added seating flexibility in the lounge, a powered patio awning, and a cabover bunk for added sleeping capacity. For those seeking the ultimate Sprinter-based Class C motorhome, the View and Navion have never looked better. See our Winnebago View inventory here or See our Winnebago Navion inventory here.